Only available at Skate City Supply. So I’ve used teflon based lubricants on bearings before and they tend to gunk up the bearings. I use PTFE fittings at work and I don’t see how it will be any different than teflon. Rebuttal? This is a totally different oil base, and it’s actually three parts. Can’t tell you what the 3 parts are, because the boss will shiv me if I give out his secret. So the teflon is suspended on the three parts which: a. seep into the bearing b. allow the lubricant to be spread c. dry and create nicely lubed a bearing without getting gunked up. Do you guys happen to carry any bearing cleaning kits? It worked great on my bearings! 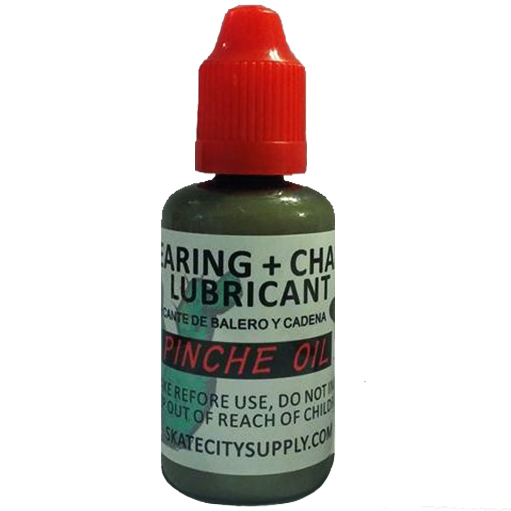 Is your Pinche Oil the same mix? Yesir it is! Different package same secret chinese recipe.